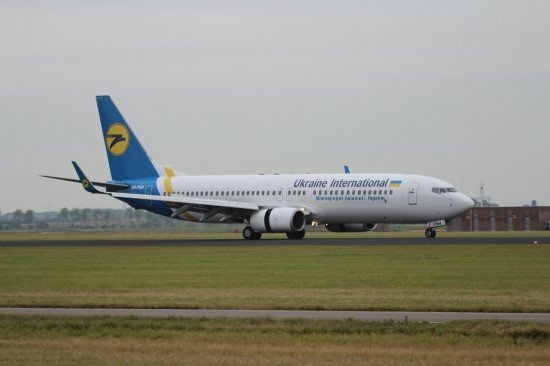 On 14 September 2013, at about 22:00 UTC, a Boeing 737-800, registration UR-PSA, operated by Ukraine International Airlines, arrived at Dubai International Airport following a flight from Kiev, Ukraine. As the aircraft touchdown on runway 12L, both port main landing gear tires failed producing vibration and causing the aircraft to drift. The aircraft had taken off from runway 36R at Kiev-Boryspil International Airport, Ukraine, at approximately 17:27 UTC. During the takeoff, a tire had sustained damage. This was noticed by the crew but they were unable to identify which tire had been damaged. The crew decided to continue the flight to the planned destination. The flight was uneventful until landing at Dubai when the two post main landing gear tires fragmented and vibration was felt by the crew and the aircraft tended to drift to the left. The aircraft continued its deceleration until it reached high speed exit Mike 09. As the aircraft vacated the runway, it stopped and was disabled as the left main gear tires had been completely destroyed, with the aircraft rolling on the wheels’rims. At that position, the aircraft nose gear was on the taxiway centreline and the tail was overhanging runway 12L. The Airside Operations Duty Manager (ODMA) called the ‘disabled aircraft recovery service provider’ informing them that runway 12L was obstructed by an aircraft. A recovery team was dispatched to the site to remove the disabled Aircraft. After the passengers and crew had disembarked, and with the cargo still on-board, the recovery team attempted to jack the aircraft and replace the affected tires. Despite several attempts, the recovery team was unable to jack the aircraft. The aircraft was then moved forward on the taxiway and the team succeeded in jacking the left side by using bedding platforms. Some 10 hours were spent after the aircraft landing to move it to the stand for damage evaluation and repairs. The Investigation determined that the causes of the prolonged runway closure were the destruction of the two port main landing gear tires, the inadequate disabled aircraft recovery plan, and the lack of training and insufficient decision-making of the ODMA and the disabled aircraft recovery team. Contributing Factors to the incident were the insufficient communication network available to the departure airport, the operations control centre (OCC), the maintenance control centre (MCC), and the aircraft. The lack of cockpit tire pressure indications, which deprived the crew of the ability to identify which tire had burst and thereby allow the crew to devise a possible mitigating landing technique.